James Loudspeaker says its SA speakers offer frequency response capabilities as broad as 38Hz to 20kHz, and the speakers are available in array of colors, including custom colors. Making its annual trip up Route 95 from New York, Sapphire Marketing just completed its annual dealer event in Boston. During the two-day event, Sapphire Marketing held a number of training classes and displayed products from a number of companies including Digital Projection, Stewart Filmscreen, Crestron, Middle Atlantic, Leon Speakers and Cineak. 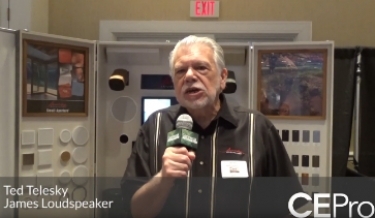 From a residential technology market perspective, the James Loudspeaker exhibit, showing off the company's SA Series, was the highlight of the show. Ted Telesky, vice president of engineering for James Loudspeaker, says the SA Series line offers integrators a choice of 170 different models, with frequency response capabilities as broad as 38Hz to 20kHz. Exhibiting in an event that focuses primarily on commercial installations, Telesky points out that James is migrating into the commercial market to help support its dealers that service commercial clients. "James has been a leader in high-end resi [residential] sound, and now we are entering the commercial industry with a number of products, including soundbars, high-end boardroom products, high-end outdoor landscape [speakers] and marine products for commercial applications," says Telesky. In addition to the James Loudspeaker exhibit, Digital Projection (DP) demonstrated its M-Vision Laser 18K and E-Vision Laser 4K products, with both the E-Vision and M-Vision products engineered to run for as long as 20,000 hours. By being able to decrease the M-Vision and E-Vision's light output by as much as 30 percent, integrators can set up the products to run based on specific environmental conditions. DP also provides a number of lens choices for both series, and emphasizes the M-Series LED-based models offer life expectancy figures up to 50,000 hours. On the other side of the DP demos was Stewart Filmscreen, showcasing its Cima product line (designed and manufactured in the U.S.). Designed as a streamlined, no-frills solution for a range of applications, Cima is available in standard sizes with fixed-frame and retractable screen options. For a more in-depth look at some of the commercial products displayed during the Sapphire Marketing roadshow stop in Boston, check out CE Pro's sister publication Commercial Integrator's coverage of the event.